The British Empire is not the first – nor last – great power to see its icons crumble. Our world was shaped by empires. Its languages, cultures, infrastructures, maps and monuments mark the movements of power across its surface. It was said that the British Empire turned one quarter of the world pink, the colour that designated its colonial possessions in imperial atlases. Parts of North America, Australia, New Zealand and Africa were named Jamestown, Victoria, Wellington and Livingstone. Nor was the British lion the only conquering beast to mark its territory. Alexander the Great named most of the cities he founded Alexandria. Several Roman towns were called Caesarea. Columbus named Caribbean islands La Isla Española and Juana. German imperialists created Caprivi and Schuckmannsburg in Namibia. The Belgian Congo had a Léopoldville, an Élisabethville and a Baudoinville. These places were littered with monuments to the greatness of their conquerors: names, public institutions, parks, places of worship and statues. As the controversy over the statue of Cecil Rhodes at Oriel College, Oxford shows, imperial legacies may be contested many generations later. For all the talk now that Rhodes was a ‘man of his time’, he was profoundly controversial when he was alive: loathed by the peoples whose lands he colonised and by his rivals the Boers, disdained by many in Britain, who feared his amorality and megalomania. He oversaw war, plunder, civil injustice and the deaths of thousands of Africans. He was also a generous and transformative benefactor to Oxford University. 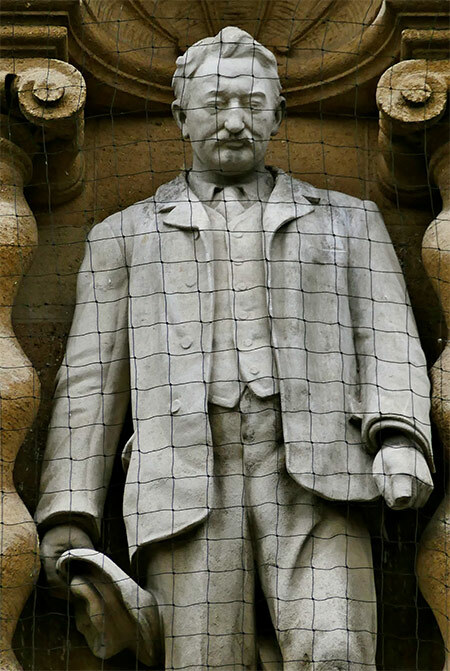 In recognition of this last fact, since 1911 a rather mousy statue of him has stood above Oriel’s main entrance. The students running the Rhodes Must Fall campaign have called for its removal to a museum, where they feel it might appear less like a relic for uncritical veneration. There are options less polarising than keeping the statue as it is or taking it away; it could be imaginatively altered or given a new inscription. Oriel responded to Rhodes Must Fall in December 2015 with an impeccably balanced statement pledging six months of discussion. Then, in January this year, the college suddenly announced that the statue would stay – reportedly in response to wealthy alumni threatening to withdraw bequests worth up to £100 million. There has been a backlash against Rhodes Must Fall, led by F.W. de Klerk, the last leader of apartheid South Africa; Tony Abbott, former prime minister of Australia; and Lord Patten, chancellor of Oxford University. The students have been accused of vandalism, political correctness and trying to obscure historical facts that they do not like. Whatever the rights or wrongs of removing the statue, it is misleading to suggest the campaigners want to obscure the facts about Rhodes. Their objection is born of remembering those facts all too vividly. Statues are not history in the sense of having significant pedagogical value. They are political symbols, which drift in or out of favour along with political and aesthetic tastes. The protesters who hauled down Saddam Hussein’s statue in Baghdad in 2003 did not deny or diminish the history of Iraq. They remembered Saddam’s legacy; for that reason, they rejected his glorification. Many in the West cheered when rebels in Hungary tore down Stalin’s statue in 1956 and when those in Ukraine knocked over several of Lenin in 2013-14. The history of the Soviet Union and its satellites may still be told and freely debated regardless of the loss of these monuments. The continuing memorialisation of the Confederacy is controversial in the US. Nathan Bedford Forrest High School in Jacksonville, Florida was originally whites-only: its name honoured a slave-owning Confederate general who was the first grand wizard of the Ku Klux Klan. By 2014 its students were mostly African-American and its board elected to change the name to Westside High. New Orleans recently voted to remove four statues of Confederate generals. It could follow the example of Delhi, Moscow and Budapest, which have created ‘graveyards’ for the monuments of past regimes. The stone countenances of party apparatchiks and colonial bureaucrats slowly erode when exposed to the elements, or are swallowed up by tangles of overgrowing plants. The grand bronze of Queen Victoria, which once sat under a canopy in Charing Cross, Lahore (now Pakistan) presides over a collection of nicknacks under strip lighting in a back room of the Lahore Museum. Schoolchildren sprawl across the Great White Queen’s lap to take selfies. Some cities still bear the imperial mark: Abbottabad in Pakistan, Livingstone in Zambia, Brazzaville in Congo. If the residents are content with these names, they need not change. Others have. Alexandria Arachiosa is now Kandahar. Juana is Cuba. Léopold-ville is Kinshasa. Southern Rhodesia, named for Cecil Rhodes, is Zimbabwe. The history of the British Raj did not vanish when Calcutta decided to spell its name Kolkata; neither the Empire’s critics nor its defenders can achieve that. In Russia, St Petersburg became Petrograd, then Leningrad, then St Petersburg again. A campaign now aims to restore Volgograd’s former name, Stalingrad, changed by Khrushchev in 1961 as part of his de-Stalinisation programme. New statues of Stalin went up last year in several Russian towns. His portraits hang in streets in Donetsk (formerly Stalino). The rehabilitation of Stalin is a disquieting trend, yet, like the others before them, these new monuments will probably not last forever. In much of the criticism of Rhodes Must Fall, the question echoes: where will it stop? Who will be next? Cromwell, Clive, even Churchill? The answer is that it will not stop. Future generations can and will interrogate the past. Whatever happens to Rhodes’ statue, it is a sign of healthy public engagement with history that there is such a vigorous debate. Monuments to historical figures and regimes stand not by divine right, but by the grace of those who live alongside them. No vision of the past can be set permanently in stone. Sixty-three years before Cecil Rhodes went up to Oriel, Percy Shelley matriculated at University College next door. His poem Ozymandias describes a traveller in an empty desert who comes across two ‘trunkless legs’ and a ‘shattered visage’ of a statue, with the inscription: ‘My name is Ozymandias, King of Kings; Look on my Works, ye Mighty, and despair!’ The British Empire was not the first and will not be the last great power to see its icons crumble. In the historical longview, as Ozymandias fell, so Rhodes will fall. It is only a question of when.